Every 18 seconds, another burglary takes place in the United States. That’s about 200 per hour and around 4,800 chances a day for someone to vandalize your property, steal your possessions and completely disrupt your notion of safety. 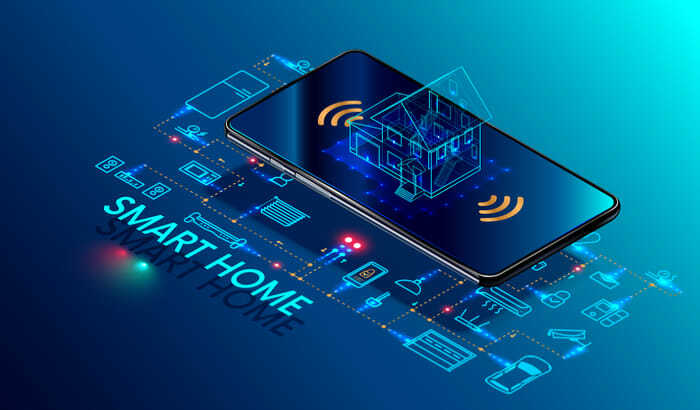 Luckily, there are plenty of home security options with new smart technology features that are designed to keep you connected and protected at all times. They’re affordable, they’re easy to operate, they eliminate the need for potentially risky human interaction and they work much faster than their antiquated counterparts. To sum it up, they’re well worth it. Explore some of the best ones that you can (and should) get today. Thanks to smartphones, today’s alarm systems are faster and more effective than ever before. Gone are the days of enabling and disabling in person, or wondering whether you remembered to set the alarm after leaving your house — now, you can turn your alarm on and off with the swipe of your phone. This on-the-go access can give you unparallelled safety and peace of mind. Throw away your keys. Encrypted with impenetrable codes instead of vulnerable locks, smart locks are a simple (yet life-changing) home-protection device. They make it easier for the people you want in your house to get in — and much, much harder for the people you don’t. Some even boast advanced features like cameras and digital notification systems, which will let you know immediately if someone has entered your home and breached the system. Similar to smart locks that use encrypted codes, fingerprint locks keep your home secure by ensuring that no one can pick the locks. These biometric locks use your fingerprints (or the fingerprints of people you trust) to open and seal the doors — ensuring that intruders cannot get easy access. Whether you’re away on vacation or just down the street at the grocery store, there’s a risk that you could leave your house and return to find it occupied by someone else. However, thanks to smart motion detectors, you’re now able to stay connected to your home and updated about any movement inside it while you’re away. Not only do these advanced motion detectors have the ability to pick up on any sort of movement in your home, but they can also pick up on subtle red flags like bodily cues and thermal imaging — so you won’t get a notification every time your dog trips over the water bowl. Gone are the days of ding-dong-ditching. Smart video doorbells send footage of someone ringing the doorbell straight to your phone. So if it’s someone you know, you’ll be alerted of their presence and know it’s time to let them in. And if it’s an unexpected guest, sinister or not, you’ll know not to let your guard down. Most smart doorbells record several seconds before and after they are pressed, in case you need access to the footage for identifying purposes. Many also have the option to alert authorities directly from the app, so it’s easier to get help when you need it.